Cambridge University Equestrian Team consists of a squad with three teams, both of which compete in their respective BUCS (British University and College Sports) league. In 2016, the first team reached the Regional Rounds, and the second team came second at the National Finals. For 2017 CUET will now have a third team competing in BUCS. There is also an annual Varsity Match against Oxford University, held each March. In 2016 the first, second and third teams won their Varsity Match. 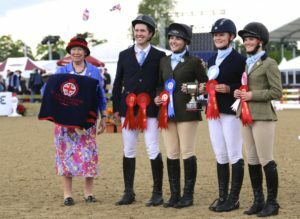 The competitions consist of dressage and show jumping on horses provided by the host team. In each BUCS competition, a rider has 7 minutes to warm up for the dressage test, and only 2 practice fences before the show jumping, both times on unknown horses. In progressing from the BUCS mini leagues, to the Regional rounds and hopefully Nationals, the dressage tests become more complicated and the show jumping becomes more technical with bigger fences. One person from each of the four universities rides the same horse, and this is decided by a draw. Scores are compared to the best rider on each horse in each discipline. Team training is organised each week and squad members are expected to attend a minimum of four sessions a term. This will be in addition to the 4 BUCS matches, Varsity and potentially Regionals/Nationals. We will also be organising dressage and show jumping clinics with external coaches this year for the squad. The first team will be expected to help run the second team home BUCS match and vice versa. Team socials are organised regularly and have a good turnout.